The very first idea explored in this season was the idea of purpose, the idea that in order to survive, humans need to have something to work toward; the show looked at that idea through Team Machine and the disguises its members had to take on, and now, we’re being posed the questions: Does purpose translate to structure? How much structure do we need in our lives? Does free will get sacrificed in the name of security, in the name of control? Similar types of questions are oftentimes tackled in the national security vs. civil liberties debate, and Person of Interest is deftly utilizing the conflict between the Machine and Samaritan to go into depth with these ideas. This conflict is aptly described as “two angry gods hurling boulders at each other”, and that immediately sets the two machines apart from humankind in general. The question here isn’t whether these “gods” exist; rather, it’s how much power will rest in their hands, how much their conflict will affect humans. Keeping in line with what we know about Finch, he states that “to say that a machine is benevolent doesn’t make it so; it just makes you blind to the reality: our moral system will never be mirrored by theirs for the very simple reason that they are not human”. He sees the inherent value in utilizing technology and in utilizing these machines, but he’s deeply afraid of the possible ramifications of an excess of power. He poses hypotheticals–what if a machine decides to end world hunger by killing off most of the population?–and warns the other members of the team that thinking a certain way could open up the floodgates, could lead to a slippery slope you can’t climb back up. “Where does it end?” he asks. Speaking of taking and giving orders, we also gain some more insight into who Greer was and is as a person; we see why he decided not to take orders from MI6 anymore and why he killed Deputy Chief Blackwood, and there’s also a nifty little parallel between the Cold War and what’s occurring in the present day POI world. I’m not entirely sure we need these flashbacks, but they’re still handled well enough; most importantly, they build off of the common thread running throughout the episode: the idea of loyalty to a certain cause, of invisible lines drawn between conflicting sides. Young Greer comes to the realization that “these invisible lines have no meaning”, that “loyalty can be purchased by the highest bidder”, that “the game is fixed” (that last one sounds a bit like Dominic, doesn’t it? ), and he loses all faith in the institution he’s a part of. It leads him to attempt to forge his own path, to attempt to mold his own idea of the world, but interestingly enough, he’s in a similar position as before; after all, he has turned himself over to a larger entity in order to fulfill his own ambitions, but I suspect he’ll be in for a rude awakening at some point. Ultimately, this all circles back to the central conflict of the show: Machine vs. Samaritan. Throughout the episode, we get glimpses of a future under Samaritan, and we also get a full on view of exactly how much power it wields. 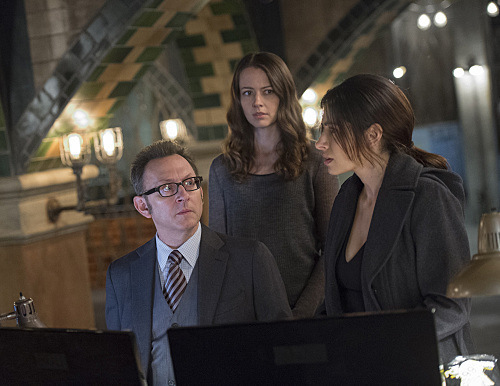 The episode sets up a contrast between peace and chaos, between organization and “human nature untethered”, and the people in the POI world are forced to confront a fear that many people in the real world have today: the revealing of secrets, the opening of doors that were never supposed to be opened. “The Cold War” is mostly set up, but it sets up a world whose scales can tip with one tiny push. “Mankind requires oversight, not coddling,” Greer says. Finally, what the show also seems to be exploring is the question of what it means to be human. In the confrontation between the Machine and Samaritan–represented by Root and Gabriel Hayward, respectively–Samaritan cites the never-ending cycle of “war, greed, and hunger” that plagues humanity, and it says that while it may not be able to change humanity, it can “reshape their reality”. Simply put, humans are able to be manipulated, but they are absolutely necessary to a machine’s survival; without humans, without info, what would be the purpose of machines? Therefore, the show is also asking us what it means to be a machine. In such a technologically advanced age, can we live with both? What will we have to sacrifice in order for us to do so? How much will our moral codes waver? It remains to be seen how the Samaritan vs. Machine conflict will play out, but for now, it looks like everything is about to change. Greer is getting ready to usher in a new era, Shaw is diving right back into a world of danger, and the tension between the machines is growing at a rapid pace. Soon, this Cold War may not be so cold. – “I’m sure that it’s impossible to leave you locked up forever…at least, against your will.” Man, the Shaw-Root flirting is never going to get old. Please don’t go where I think you might be going with Shaw, writers. -I like the idea of Samaritan as a precocious kid. The scene itself starts really shaky, but it improves as it progresses. -The entire church sequence is really well done, what with the whole conga line of gun pointing. They really should’ve just kept going with it: you know, have Greer pop up behind Reese with a machine gun, then Fusco pop up behind Greer with a tank (or a spaceship), etc. -Finch’s passcode for the vending machine is 3.141. Nice. -Shaw, Bear can easily help you stop the world from burning down. You don’t need to leave him there. -Root in a bear suit. Next up: Bear in a bear suit. -We’ll see you back on January 6th for part 2 of the three part trilogy, “If-Then-Else”. CBS, enough with your awful scheduling! So let me say that I was so excited that the show was back but alas we all have to wait until January 6th 2015 to see part two! NOT FAIR!!! At any rate I loved last night’s episode. This show intrigues me and thrills me, and not many shows do. I am worried for team Machine to be honest, but they in the end have to prevail, I just find the hubris and arrogance of Samaritan to be overbearing at times, they really think that nothing can touch them. I found it especially smug that Greer thinks that the Machine is fighting back but is “no match for Samaritan”. Greer seems to forget about who is the father of the Machine and the uncle per se of Samaritan, he seems to fail to remember who and what Harold Finch is and what he can do. And Martine thinking she will destroy Shaw and Reece, I just wanted to tell her to “SIT DOWN!”, personally I would have taken the shot if I was John and just taken her and Jeremy out. By the way I forgot about Jeremy to be honest, he is like a young version of MI-6 Greer. This episode brought up so many questions and thoughts for me. When is the thing that Harold planted on that woman’s laptop going to take effect and what kind of damage will it do? I just hope that it is devastating to Samaritan, I have a feeling that it will be. Again who the dillio is Jeremy and where the dillio has he been? I WISH that Shaw would stay put! Lord love a duck! Its like she has a death wish and I really wish that she did not, I want her to stay around, I want all of them to stay around. I just wish that Harold would let go and trust his Machine, it does have a sense of morality for it said as much to Samaritan’s Child of the Corn avatar, that was NOT Root talking but The Machine and it cares. Harold holding back with his fear(s) is not helping. He has to trust the process. He knows what the bad looks like he has seen it with Samaritan playing Clash of the Titans with people. What will it take for him to understand that sometimes there are ‘necessary evils per se’ he of all people as a master computer programmer should know this and understand this. They have lost too much already, Carter because he would not let Root go and help when she asked him to trust her to, and firstly not killing that Congressman when it needed to be done. The thing is that I think that Harold does not realize yet is the Machine unlike Samaritan is letting people make the choices/freewill for it could have easily have killed that Congressman by setting things up. The Machine is asking to be trusted and for it to have faith freely given to it. So many, philosophical, religious and dogmatic undertones to this show! I love it and the deep philosophical thoughts it can create, ( as an aside I am sure that someone could create a University level ethics course based around this show.). I found it interesting to see Greer in his young ( I would not say Bond but rather more Man from U.N.C.L.E. personae) and why he left MI-6. I find his reasoning at odds, because if he does not care about lines/borders/sides and the world why is he so willing to create new lines/borders/sides with Samaritan? Dude is totally Sith killing his master as all Sith eventually do, but I think that his ‘Sith padawan Samaritan is going to be the death of him’. Yes I think that Greer only kowtows to Samaritan he really thinks that he is the true Master, he really thinks that no harm will come to him as do Jeremy (Greer jr) and Martine( the poor man’s Shaw). I am waxing lyrical, forgive my musings as this the only place I can do so and talk about how much I love this show! On the PoI Facebook page most of the people just whinge about how they wish Carter could come back ( I AM NOT KIDDING) and how the show should be just about John and Harold and they should just save people like the did in the beginning. They keep complaining how the show is now awful, poorly written and that Nolan is an very stupid man. Egads. I truly think that those people think that the show is written and plotted out just a hour before it comes on tv, like the show runners and producers have no idea or plan on how they want to tell this story. Again I digress. Back to the episode, one thing that I found interesting was how Samaritan does its time line, it goes vertically, and its flashbacks are done in a cold light where as The Machine’s are horizontally done and are shown in a warmer light, in other word a tad more human looking. Also people look a time and memories like The Machine does not like Samaritan. I loved that Shaw saw some merit in the way Samaritan does things, but I think by the end of the show when she made the choice to go out there despite what could happen to her that she understands that the Machine is the right way. I enjoyed the avatar talk with Root and Gabriel as the Machine and Samaritan it was telling, someone likened it to the chat that the Emperor has with Luke in Return of the Jedi ( sorry for all the Star Wars references, I am a BIG StarWars enthusiast), Samaritan is going to have a huge fall, there will be blood on team Machine side but it may be more emotional blood than physical blood. I am thrilled and excited for parts two and three and I can hardly wait for Jan 6th, which ironically is the day of Epiphany and your take on the episode! No need to apologize, I love your comments! I look forward to them every week. I’m going to really dig into your comment and respond this weekend when I have some time. Happy holidays to yourself! And to answer an earlier question, I have not been able to fit The Flash into my schedule. Maybe at some point! Oh and I re-watched this episode because I always miss things and pick them up the second time around(re-watching this show is for my like re-reading one of my favourite novels, I love it!). I missed it the first time but I just howled when Shaw took her drink back from Root and then proceeded to wipe the straw clean on her coat while glaring at her. And I loved Harold’s reaction when he realized Shaw was out of the handcuffs, his face was just too funny. Oh and Bear is just so darling, I adore that dog and I really do not care for dogs. Also I re-watched the episode with Harold and the first man in the suit, it was there that Jeremy made his first showing, but I do wonder what he has been up to all this time? And it was nifty to see Reece doing his CIA stuff and of course Shaw being all Shaw. 🙂 The Machine was waiting to bring them all together at the right time.